I looking for information on this item, I have not been able to find anything. I'm not sure what kind of metal it's made of, hopefully gold. 25th anniversary of the Reunification of Jerusalem occured in 1992. I'm sure this is what's being commemorated here. 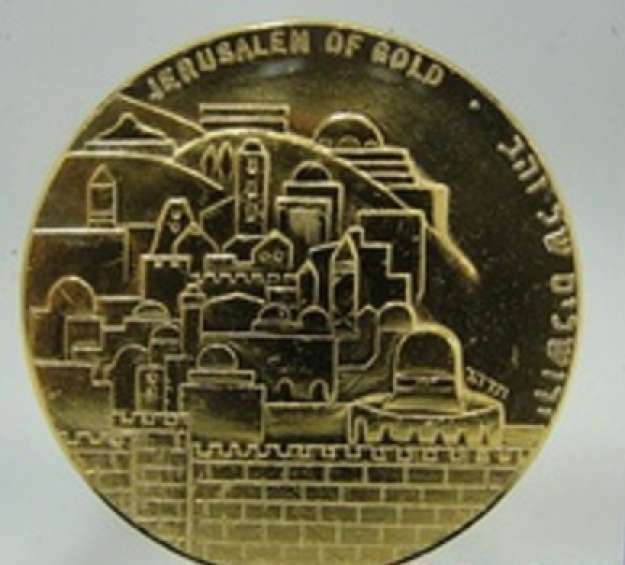 As well, there is a more recent 3 coin set called the Jerusalem of Gold series but I've lost the link on that... nevertheless, no match on any of those gold denominated coins. I'm not going to bring a political discussion into such a forum but I do think its important to point out Israel is the only country in the world who considers the city of Jerusalem to be a unified city but I thought that was only very recent and more of a statement of intent than anything and even that hadn't happened yet in 1992. My reading of this coin is that it celebrates the re-unification of West Jerusalem with Israel in 1967 and not its re-unification as a single city. Internationally East Jerusalem is still officially recognized as being part of Palestine not Israel. I won't get into any political discussion beyond that though. Its a very beautiful coin and it does nicely illustrate one of things I most enjoy about various coins and tokens, their historical context and the social/political/economic world views represented on them. In my opinion at least this would have a greater value based on its historical context than on its composition, unless its to be melted down which would be a real shame. To me melting down coins is akin to burning books though I can understand why someone might melt down a gold coin its still a terrible loss of a historical artifact even if its not particularly old right now someday it will be. It certainly appears to have at least some gold content if not pure gold or at least be gold plated, that or one of the best replicas of actual gold I've seen. I would assume besides its appearance a coin marking such an important anniversary would be real gold or at the very least gold plated though I'm sure pure gold versions of this were minted which this is could only probably accurately proven by its weight, the other test for gold mentioned would give a positive result for gold plating too. Thanks for your replies. I do understand that coins have two values, bullion and numismatic. Besides it's gold value I am very interested in this coin\medallion, I have not been able find an exact match for it anywhere. I'm thinking about email the Isareli mint and asking them for information. I doubt the Holy Land Mint would know anything of it but you could try. Here's a very similar silver medallion produced by the same private firm as yours I would think. The obverse(?) is the same. BTW, who exactly, besides our federal government, is melting down gold coins? Have the Chinese bought up all the gold bars already? Last edited by verdigris on Sun Apr 07, 2013 12:14 pm, edited 1 time in total. I received this reply from a friend fluent in Hebrew. Seems none of us hawkeyes could read the English lettering at the bottom, but now knowing what it says it appears obvious. ISRAEL'S 25th ANNIVERSARY. Reading from the bottom up, on both sides [of the stylized 25]. 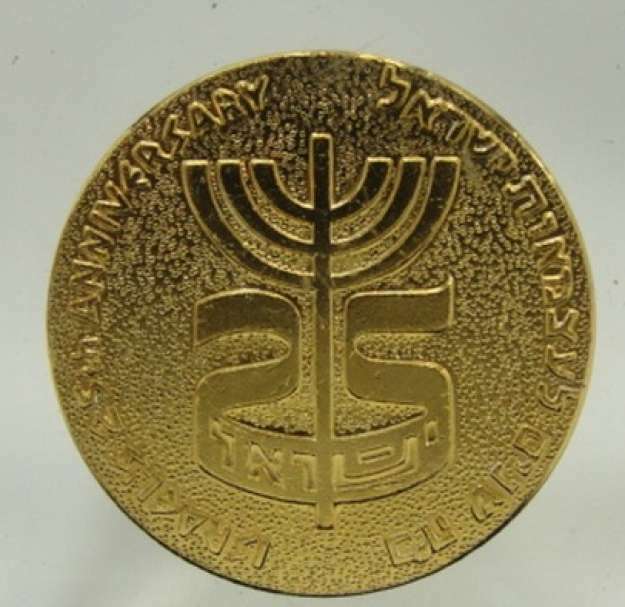 The left, in English, the right side in Hebrew, "Israel's 25th anniversary", which means it was issued in 1973 (25 years since the establishment of the state). On the other side, "Jerusalem of Gold" (Yerushalayim shel zahav) is a phrase from a song made famous by a young British immigrant, Shuli Natan, during the Israel Music Festival in May, 1967. Let me be a violin to all your songs." Thanks for the information, I appreciate the work you've done.